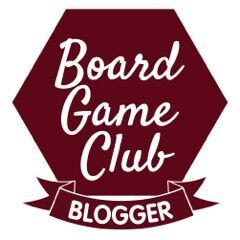 The What's So Special About...? series of books were published this week by Dragonfly Group. They are really interesting and different factual dinosaur books featuring individual dinosaurs. 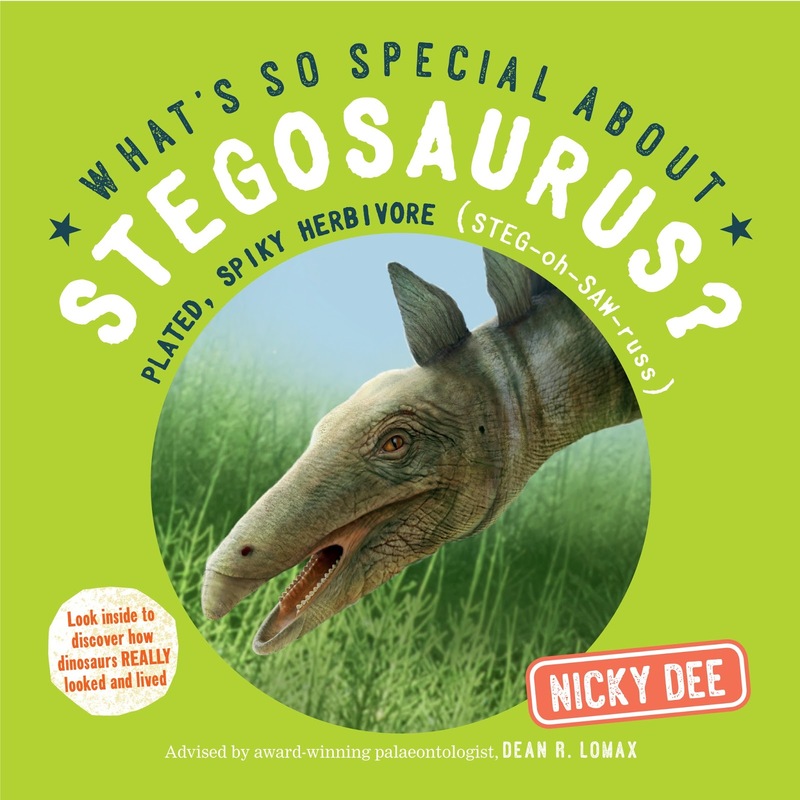 The books have been written by dinosaur expert Nicky Dee and verified by multiple award-winning palaeontologist Dean R. Lomax. 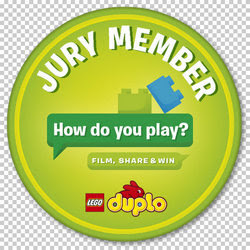 We've been sent What's So Special About Stegosaurus? and What's So Special About Tyrannosaurus Rex? to review. Both books are square paperback books with a good thick cover and 32 full colour pages, rrp £5.99. I had told my children we were going to read What's So Special About Stegosaurus? when they were in bed, I didn't realise just how into it they were going to be. 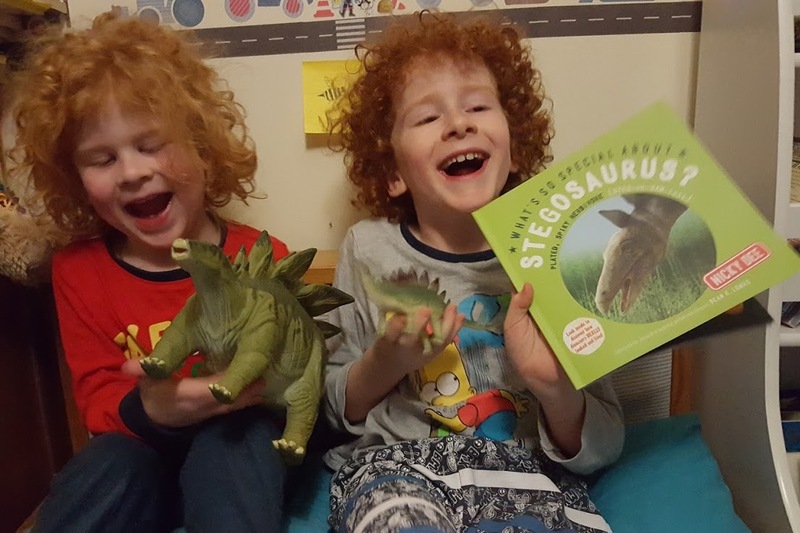 It was great though for comparing our Stegosaurus and the illustrations in the book, and wondering which one was most realistic? 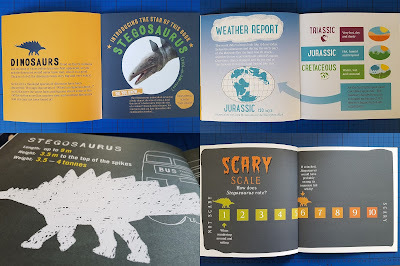 Inside the book you are introduced to the Stegosaurus, and then each page or double page has all kinds of relevant facts written in language children understand. 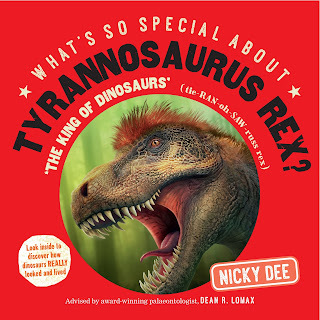 My 7 year old had no trouble reading most of the words, as dinosaur names are also given phonetically - Tyrannosaurus rex (tie-RAN-oh-SAW-russ rex), but he was uncertain of a couple of meanings, so it opened up a lot of discussion. The variety of facts is good, and I particularly liked some of the illustrations for their sheer clarity, including one which showed how big a Stegosaurus actually was in comparison to objects children understand - a bus for example. Everyone loves a T-Rex, and What's So Special About Tyrannosaurus Rex? doesn't disappoint, with facts including just how big those teeth actually were. My boys spent easily twice as long laughing, discussing and staring at each other mouth agape, as they did actually reading. 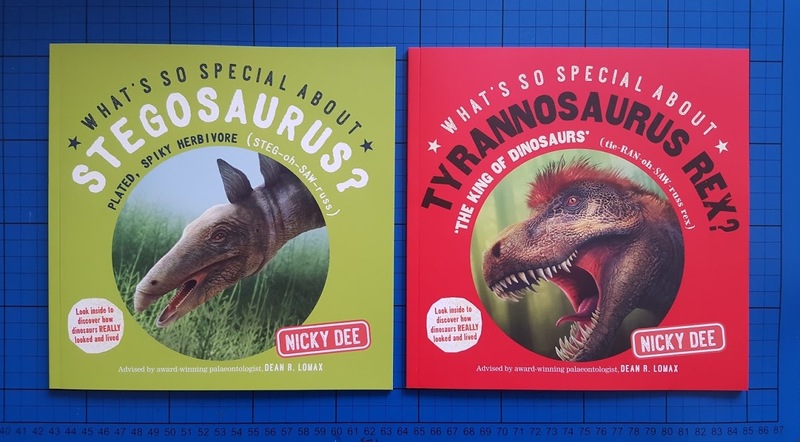 I think these are excellent dinosaur books for any fan, and excellent 'interesting facts' books for any information obsessed primary school child. The text is in small, snappy chunks, and everything is so visual that despite all of the tricky words, it isn't actually intimidating, even for my new 6 year old. 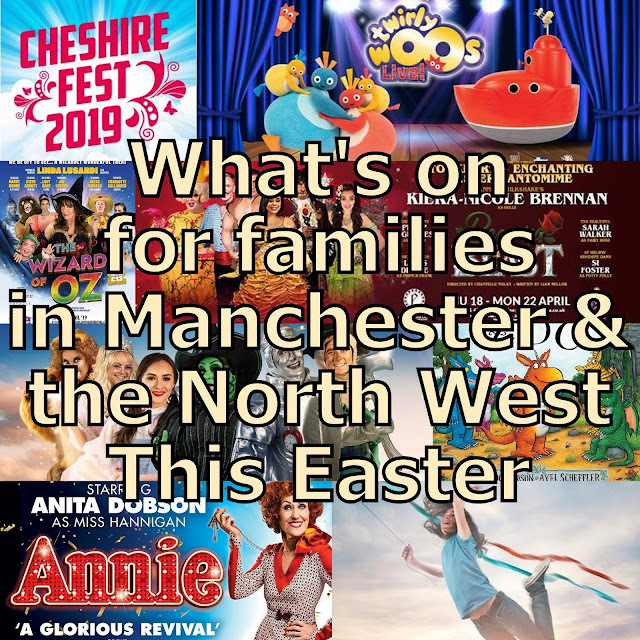 Alongside the books is a Special Dinosaurs Educational Website with dinosaur information, games and competitions designed to help children and parents expand their dinosaur knowledge. You'll also find a look behind the scenes at the making of the 3D models used in the books, and how the illustrations were created. 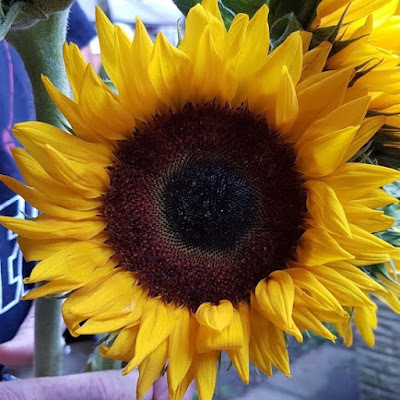 At £5.99 each the What's So Special About..? series are really good value for money and make excellent gifts. 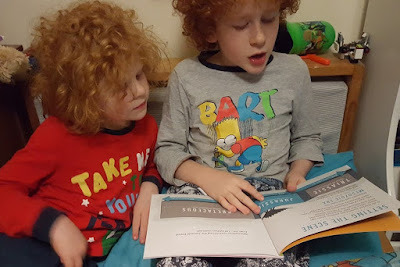 I think they can be a great tool for reluctant readers, they certainly put us straight on quite a few myths and are fascinating for the adults as well as the children. What’s so Special about Stegosaurus? What’s so Special about Ankylosaurus? What’s so Special about Tyrannosaurus rex? and What’s so Special about Coelophysis? are available to buy now from all good bookshops in store and online, including Amazon. Four more books in the series will be available from September. Every dinosaur hatched from an egg. Each female dinosaur would lay lots of eggs at one time, from as few as three to as many as twenty. No T. rex eggs have been found … so far! These look fantastic. I'll be checking out the range for Bud. 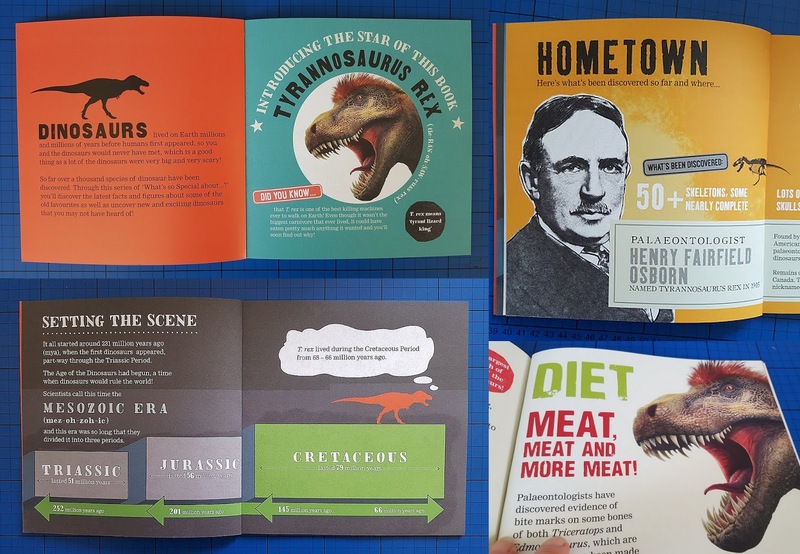 He has quite a dinosaur book collection but these look to offer something different. These books look brilliant! Great details. These look great, will have to track them down for Monkey, as clearly you can never have too many dinosaur books.